Located on Prescott Way just off St. James Ave, Extra Space Storage serves residents of Goose Creek, Wide Awake, Woodbridge, Sangaree, and more. Locals will recognize our facility next to St. James at Goose Creek Apartments near Walmart. Extra Space Storage on Prescott Way offers a wide range of storage units, climate-controlled storage, drive-up access, and exceptional security. We're your go-to storage solution in Goose Creek! 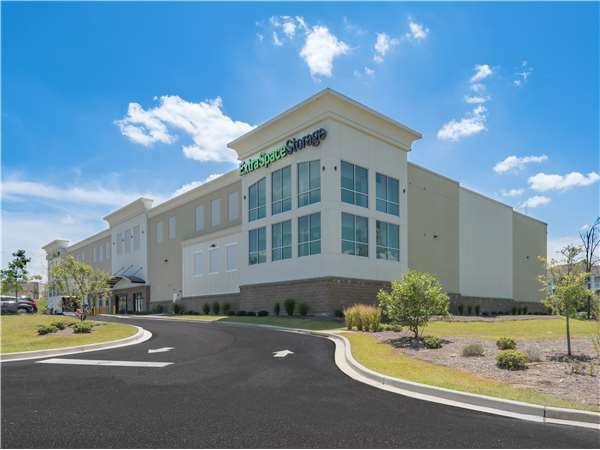 With units ranging in size from 5x5 to 10x30 and convenient unit features like first-floor access, elevator access, and drive-up access, our Goose Creek storage facility has the storage space you need! Store valuable items with confidence at Extra Space Storage! Our facility is equipped with security measures like 24-hour video surveillance and security access to your floor only. When storing delicate items in Goose Creek, a climate-controlled unit is highly recommended. These units protect your belongings from extreme heat and humidity by maintaining temperatures between 55? and 80? year-round. We also have units with both climate control and drive-up access. Save time and energy with drive-up access! This amenity makes it easy for you to unload and load items by pulling a vehicle right up to your unit. Drive-up units can even be used for small vehicle storage. At Extra Space Storage, we want each and every customer to have an excellent self storage experience. From our friendly, professional staff to our well-maintained, secure, clean facility, we go the extra mile to ensure you get a high-quality storage solution with great service. Contact us today to reserve a storage unit in Goose Creek! Beautiful, clean, secure facility. Price is more than impressive. Impeccable customer service. I was immediately greeted by a friendly associate, who took me through the process of renting a unit. Having never used storage before, I found that everything was explained clearly and thoroughly. Overall, it was quick and easy, and a great experience. I walked in the facility looking for price ranges. My intentions were to shop around. That didn't happen. I was given options of different units, showed around the facility, all my questions and concerns were answered to the fullest without delay. This facility saved me $82.50 compared to what I was paying at my other storage place. I was impressed with the cleanliness, the security, and to me the attitude and knowledge of the staff. Couldn't ask for anything better. The staff at this location are very friendly. They took the time to answer all of my questions and provide me with the best storage option. They gave me a personal tour of the facility, allowing me to verify the conditions of the unit. It is a brand new facility, very clean. They also provide moving carts! The staff was really professional and helpful. A great job explaining options and prices. The facility is really nice and clean. A great experience so far and completely satisfied. Great Security Features. Extremely clean & well lit. Customer service helpful & friendly. Clean, very cool on the hottest days, helpful and friendly staff, carts they provide are awesome, prices are competitive. Would recommend. My experience with Extra Space Storage was great! The staff was accommodating and friendly. They helped me to get the right sized storage for my belongings which was a relief considering I was having to downsize and was on a tight budget and timeline for my move. Donna and Ashley were great! They both were extremely thorough and helpful! This made rent a storage space hassle free! Clean neat facility. Easy access. Great customer service. You wanna secure place and clean place for your belongings .Also reasonable prices and promotions for your budget and great security while you are unloading and loading.. Extra Space Storage on Prospect Ave in Goose Creek, SC is a nice, new storage facility with climate controlled and regular units. As it is new, everything is clean. The folks there are friendly and easy to do business with. If you need a storage unit for any length of time, they are the people to see. I was impressed by this facility. The staff was top notch, knowledgeable and friendly. The space I rented had a secure lock, was clean, had the floor sealed and was climate controlled. I would recommend this place to friends and family. The facility was very clean and secure. The staff was professional, courteous and very engaging. The value was really just a bonus. St. James Ave and Spring Lake Way, next to Walmart and beside St. James at Goose Creek Apartments. Drive southeast on St James Ave. Turn right onto the road between Firestone Complete Auto Care and Arby’s. Our facility will be straight ahead behind Firestone. Drive northwest on St James Ave. Pass Lowe’s and Walmart and continue north. Turn left onto the road between Firestone Complete Auto Care and Arby’s. Our facility will be straight ahead behind Firestone. Drive west on Old Mt Holly Rd. Turn right onto St James Ave. Pass Walmart and continue north. Turn left onto the road between Firestone Complete Auto Care and Arby’s. Our facility will be straight ahead behind Firestone. Drive east on Myers Rd. Turn right onto St James Ave. Turn right onto the road between Firestone Complete Auto Care and Arby’s. Our facility will be straight ahead behind Firestone.